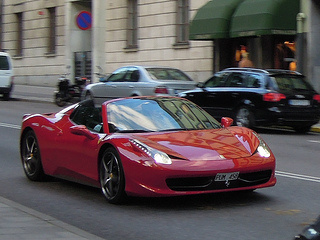 The 458 Spider sports car, also referred to as the Ferrari 458 Italia Spider, was introduced in 2011 at the Frankfurt Motor Show, and priced at $257,000. 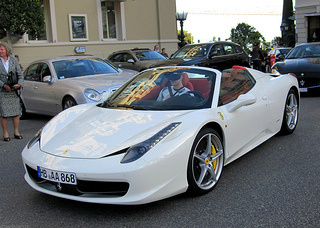 It was the convertible version of the 458 Italia, and featured a unique retractable hardtop. This was, in essence, a roadster that replaced the conventional soft top with an automatically operated hardtop, made entirely of aluminium, which stored itself away in front of the engine bay in as little as 14 seconds, and without affecting the car's aerodynamics. The coefficient of drag remained at 0.33. 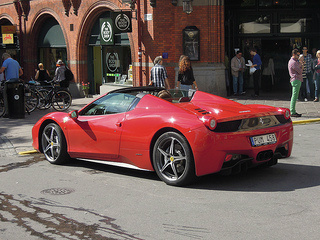 The engine cover of the 458 Italia was modified to contain this new system, which actually weighed 25 kg less than that of the soft top used in the F430 Spider. An additional benefit was that extra space was created behind the seats in order to store luggage, etc. Externally, this sports car looked very similar to the coupe variant, with the front section remaining unchanged, whilst the rear area received minor styling changes to maximise the flow of air to the engine's cooling ducts and oil cooler. 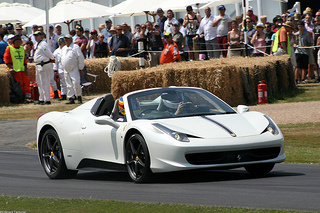 A further innovation was that the 458 Spider was fitted with a large, adjustable, electrically operated wind break, which was designed to slow down and dissipate the airflow throughout the cockpit so that conversation between the occupants was not affected, even at high speed. The Spider weighed in at 3153 lbs, slightly heavier than the 3042 lbs of the 458 Italia. It had an aluminium body on an aluminium chassis which had been strengthened in order to withstand the additional stresses consistent with the removal of the roof section. It used rear wheel drive, with 20 inch wheels, and carbon ceramic ventilated and drilled disc brakes. There was a steering wheel mounted Manettino switch which controlled the limited slip differential (E-Diff), the traction control (F1-Trac), ABS, dampers and transmission, all activated electronically. 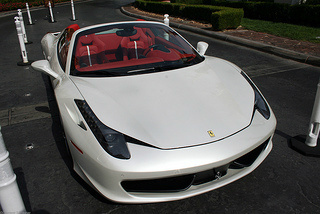 The 458 Spider was powered by the same 4.5 litre, V8 mid-engine, with the new direct fuel injection as used in the 458 Italia. It produced the same 0-60 mph time of 3.3 secs, whilst the top speed was 3 mph slower at 199 mph. It had a huge 12.5:1 compression, and used a seven speed Getrag F1-style paddle shift gearbox with a dual clutch. The Spider produced 570 bhp at 9000 rpm (the red line), and 398 ft/lbs of torque at 6000 rpm, with most being on tap down at 3250 rpm. Overall fuel consumption was 21 mpg. A Ferrari 458 Italia Spider in good condition could fetch around $300,000, whilst an example in showroom condition could command up to $525,000.